A complete product review of the best RV surge protector for your outdoor lifestyle. I have answered some frequently asked questions about this topic. 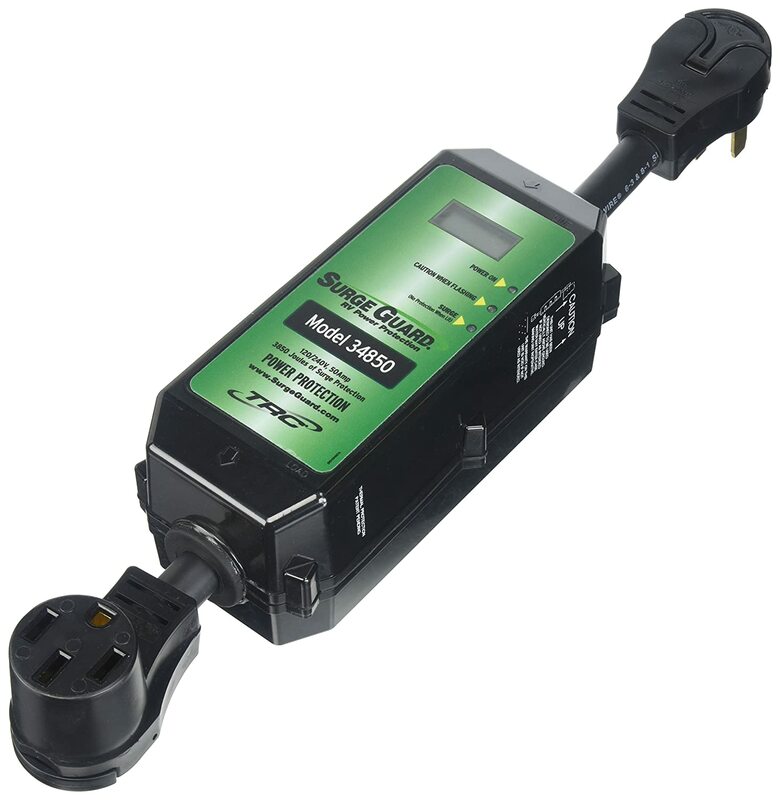 Anyone who has taken their RV on a road trip which involved stopping at RV parks or hooking the electrical system up to various power sources is probably familiar with the need for a good surge protector. A surge protector can save the electrical system in your RV from certain doom in situations where a power source is unregulated, broken or hooked up improperly. What is the science behind surge protectors? What Makes A Surge Protector Worthy Of Your Money? This can be particularly true in areas of the country which are more rural and with less modern electrical configurations. So it is pretty much a given that a surge protector at minimum is required if you plan to hook your RV up to power sources while traveling. What is less obvious is which surge protector is the best for your RV. Here, I will share with you some ideas and information on choosing a surge protector that keeps your RV safe from power surges and other electrical anomalies that can mean big bucks in repairs if the right equipment is not in place. Inside a RV surge protector. Surge protectors are devices that regulate the flow of electricity from an electrical output to the devices which you wish to power. They come in a wide variety and with an array of different features. In order to know which surge protector is best suited to your RV, some knowledge of the science behind the use of electricity is important to have. This would include an understanding of the units of measurement used in measuring electricity. The most important measurements to be familiar with are voltage, amperage, and watts. If this information is new to you, I will give you a quick rundown of how it all works. Voltage is the measurement of the amount of force in which electricity travels through a conductor, such as a wire or conductive metal such as copper or aluminum. A common misconception is that voltage is the amount of electricity that is delivered by a given power outlet. This is not the case. Voltage is not a measurement of the amount of electricity that is present, but as I said a moment ago, it is the amount of force or pressure that the electricity is traveling at. If you look at almost any consumer electronic product, there will be a tag or sticker somewhere on the device that states the devices voltage input and output ratings. There will be a tag or sticker somewhere on the device that states the devices voltage input and output ratings. This is important, as powering a device with too little voltage will not allow the device to even turn on, or, with too much voltage will likely destroy the device beyond repair. In the US, the standard amount of voltage which comes from a common wall socket is 140v. In most of Europe and Asia, wall sockets deliver 240v. A device built to run in the US being plugged into a European wall outlet without a proper transformer or voltage regulator will almost surely destroy the device within seconds. Use transformers and voltage regulators in situations where you need to adjust the levels to be compatible with your equipment. Amperage, or “amps,” is the amount of electricity available in a given electrical current. A device will require some amount of electricity to perform its function, and if a current does not provide enough available electricity, the device will struggle or fail in its task. Unlike voltage, where powering a device with too much voltage is dangerous, amperage is somewhat the opposite in that powering a device with less amperage than necessary is more likely to destroy your device or cause problems than a power source which has more amperage than required. Powering a device with less amperage than necessary is more likely to destroy your device or cause problems than a power source which has more amperage than required. The reason for this is that a device will only use as much amperage from a current as it requires, allowing the excess to flow through a bypass or back to the ground. If there is not enough amperage to power a device, however, the device will struggle to carry out its function and work harder to extract the needed energy from the electrical current. This usually results in a device heating up and running hot. If the situation is bad enough, the device can even catch fire. Like voltage, the amperage ratings of a device can be found on the tag or sticker somewhere on the device. Pay attention to these tags. The health of your device and possibly your life can depend on it. Watts is another measurement of electricity which is more commonly used to determine the energy usage and efficiency of a device. The wattage of a device can be determined by calculating the amount of voltage and amperage that a device uses. The formula used to accomplish this is A x V = P or amps multiplied by volts equals the amount of power used. Ideally, you will want to choose a surge protector for your RV that fits the following criteria. You want to know the amount of power that your RV’s electrical system requires to function properly and get a surge protector that is rated well above your RVs max level of energy consumption. Choosing a surge protector that is rated higher than your energy requirement ensures a margin of safety should some severe problem occur. Aside from power ratings and output levels, additional safety features like emergency shut-off switches, indicator LEDs or alarms, and automatic problem detection is important. The surge protector you choose should be cost effective and fit your budget. While you don’t want to be a penny pincher in instances that involve safety such as this, you also don’t need to spend money on the biggest surge protector when you plan to use only a small amount of electricity, or have a smaller RV that simply doesn’t require the most powerful equipment. You don’t want a product that is difficult to install or configure. Something too complex can result in a misconfiguration when installing, especially if you are not seasoned in these types of things. The more straightforward and simple an installation is the better. The TR-44729 takes the cake in our pick for the best all-around surge protector. 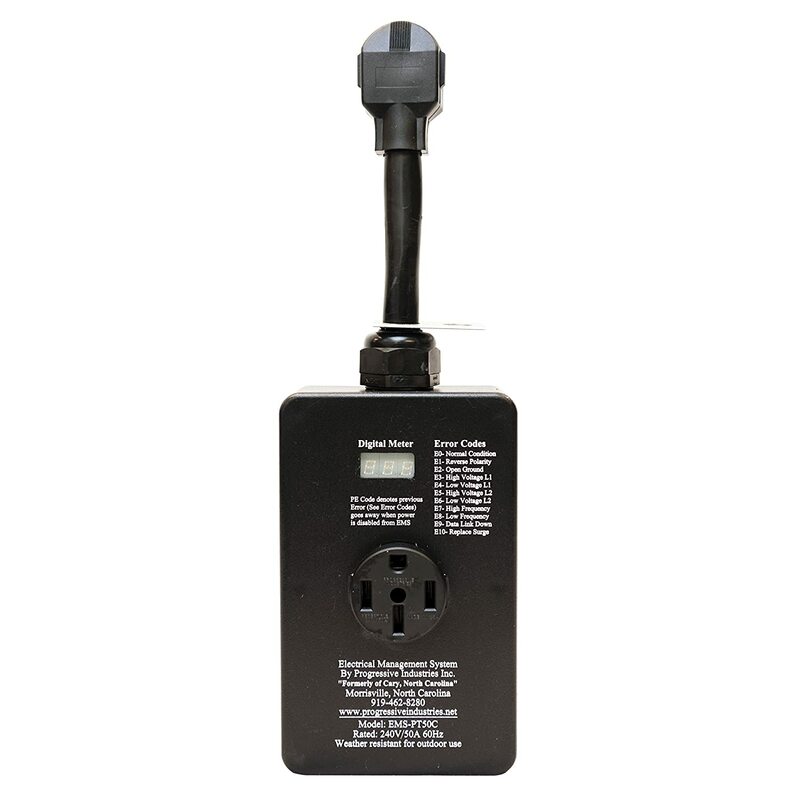 It is rated at 50 amps, has all of the additional protection and safety features that we want, is portable, weather resistant, extremely simple to hook up and use, and is impressively priced at $94 which is about a fifth of the cost of other similar products. 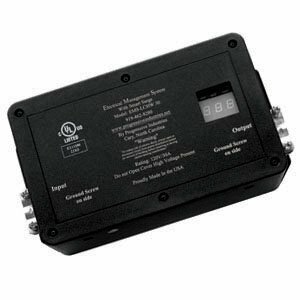 It lets you monitor its levels and is prepared for faulty RV park power supplies. Everything you need in a 50 amp surge protector at a great price. Cons – We could find no cons in this product. It does what it says and is priced competitively. When it comes to RV surge protectors, Progressive Industries seems to be the market leader. 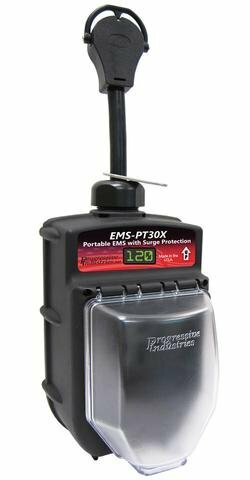 Their EMS-PT30X model offers an ‘all-in-one’ solution, with all the safety features to protect against a wide array of common electrical problems and human errors. All of this is built into a single unit with rugged weather protection, a lifetime warranty, and a competitive price. It’s a bit more costly than other units out there but far less costly than having to repair your RVs entire electrical system or treating injuries from electrical mishaps. Complete protection, durable design, lifetime warranty. More expensive than most 30 amp surge protectors, warranty excludes weather shield. The next on our list is the TR-34850. This thing is full featured and powerful. Rated at 50 amps and with a full spectrum of safety features and mechanisms, this thing is suited to work in almost any situation. It has a weather guarded casing, LED display and indicators, emergency shut-off switches – the works. The only problem is that it is significantly more expensive than other models and does not boast any kind of lifetime warranty like the PI products do. Still, a very solid choice. 50 amps, full-featured, versatile and reliable. No lifetime warranty, higher cost. Here is another solution for people who want a surge protector that is rated at 50 amps. This one is a solid choice made by Progressive Industries which has most of what you would ever need in one unit. While this is a quality product, it is far more expensive than 50 amp unit by TR while having fewer features than the 34580. Still, it is made by a reputable company and thusly has similar warranties covering it. Another good, although pricey choice. 50 amp power rating, a wide array of safety features. No LED screen for monitoring, $400 + price tag. Here we have another full featured model by the folks at PI that is rated at 30 amps. It covers low and high voltage surges, has a good warranty and costs about half of what their 50 amp models cost, making it a solid choice for those who don’t require a 50 amp surge protector. Low and high voltage protection, warranty and reputable manufacturer. Rated at only 30 amps. All of these surge protectors are of good quality but if it is just me who will pick one to be labeled as the best, I think the title goes to Technology Research 44270 Surge Guard 50 Amp Surge Protector. It has everything that you need to keep your RV safe and have all electricity controlled. This is also affordable, so your wallet surely won’t be hurt when you purchase it. I would appreciate your comments on the box below, so please feel free to share with me your thoughts regarding this matter. Thanks for putting this together! I really got a lot out of it.